“I’m coming for you, dragon.” Showtime just released a new teaser, poster, and premiere date for their new TV show, Black Monday. From Seth Rogen and Evan Goldberg, the comedy series is set in 1987 and tells “the story of how a group of outsiders took on the blue-blood, old-boys club of Wall Street and ended up crashing the world’s largest financial system, a Lamborghini limousine and the glass ceiling.” The cast includes Don Cheadle, Andrew Rannells, Regina Hall, Paul Scheer, and Eugene Cordero. Black Monday debuts on Showtime on January 20th at 10 p.m. ET/PT. NEW YORK – December 14, 2018 – SHOWTIME has released the official poster and a new teaser for its upcoming comedy series BLACK MONDAY. The series stars and is executive produced by Emmy(R) nominee and Golden Globe Award winner Don Cheadle and stars two-time Tony Award nominee and Grammy(R) winner Andrew Rannells (Girls) and Regina Hall (Girls Trip). Screen Actors Guild(R) Award winner Paul Scheer (Veep) also stars. 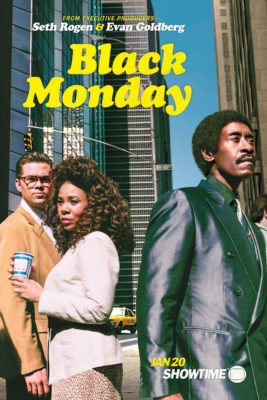 BLACK MONDAY was created by David Caspe (Happy Endings) and Jordan Cahan (My Best Friend’s Girl), who serve as executive producers and showrunners. Emmy nominees Seth Rogen and Evan Goldberg (Preacher, Superbad, Future Man) are executive producers and directed the pilot. The 10-episode series will premiere on Sunday, January 20 at 10 p.m. ET/PT. BLACK MONDAY takes viewers back to October 19, 1987 – aka Black Monday, the worst stock market crash in the history of Wall Street. To this day, no one knows who “caused it” … until now. It’s the story of how a group of outsiders took on the blue-blood, old-boys club of Wall Street and ended up crashing the world’s largest financial system, a Lamborghini limousine and the glass ceiling. A co-production between SHOWTIME and Sony Pictures Television, BLACK MONDAY guest stars include Yassir Lester (Making History), Horatio Sanz (Glow) and Michael James Scott (Aladdin on Broadway), with recurring guest stars Casey Wilson (Happy Endings), Ken Marino (Wet Hot American Summer), and Kurt Braunohler (Bunk). Emmy(R) and two-time Oscar(R) nominee Bruce Dern (Big Love), Melissa Rauch (The Big Bang Theory), Julie Hagerty (Airplane), Kadeem Hardison (A Different World), Eugene Cordero (Kong: Skull Island), Vanessa Bell Calloway (SHAMELESS), Tim Russ (iCarly) and Jason Michael Snow (The Book of Mormon) have also signed on as guest stars. What do you think? Are you a fan of dark comedies? Will you watch Black Monday? More about: Black Monday, Black Monday: canceled or renewed?, Showtime TV shows: canceled or renewed? 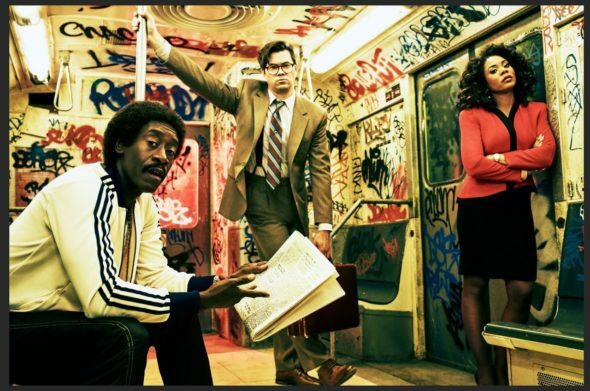 Black Monday: Is the Showtime TV Series Cancelled or Renewed for Season Two?